Powerpuff girls and Rowdyruff boys Kids. . Wallpaper and background images in the パワーパフガールズ club tagged: powerpuff girls. This パワーパフガールズ photo contains アニメ, 漫画, マンガ, and コミック. There might also be ベン図, ベンの図, ベン図形型図表, and ベン図形型の図表. Sorry But Butterscotch is someone elses. Sorry. 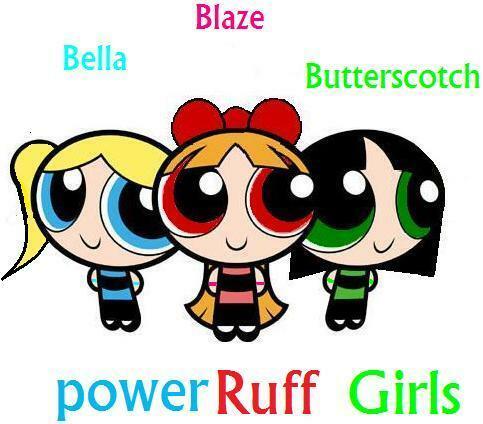 Bella and blaze are someone elses too. This whole picture is practically stolen. Dudes, chill, everytime you see someone that has the same name as you (like in yr school) do you say "HEY! YOU STIOLE MY NAME!!!!"? No, so y does it matter is her characters have the same name as others? that is exactly what goes through my mind when those kinda fights start on this club. tons of REAL people have the same name, so it should'nt really matter if to characters have the same name. especially OC's.